Thanks for reading my article! If you would like to learn more about irritable bowel syndrome and probiotics, please visit my article about the 5 best probiotics for IBS. Additional information about theworkings of probiotics in general can be also be found here. Mary E. Morgan has a doctorate in immunology and fifteen years of research experience. Her specialties are intestinal diseases and microbiota. How Solid Is the Clinical Evidence for the Align Probiotic? Credit: TipsTimes via FlikrThose with irritable bowel syndrome (IBS) suffer from cramping, bloating and abnormal bowel movements. Depending on the predominate symptom, IBS can be classified as IBS-D (diarrhea), IBS-C (constipation) or IBS-A (abdominal pain). It’s unknown why it occurs. Some researchers have suggested brain-gut connections due to its association with stress, while others believe that intestinal bacteria probably play a larger role. Medication for IBS depends on the form of IBS, and the options include laxatives, antispasmodics to reduce intestinal spasms, antidepressants and drugs that regulate the neurotransmitter, serotonin. However, many patients would rather avoid drug use and find a gentler, more natural treatment. 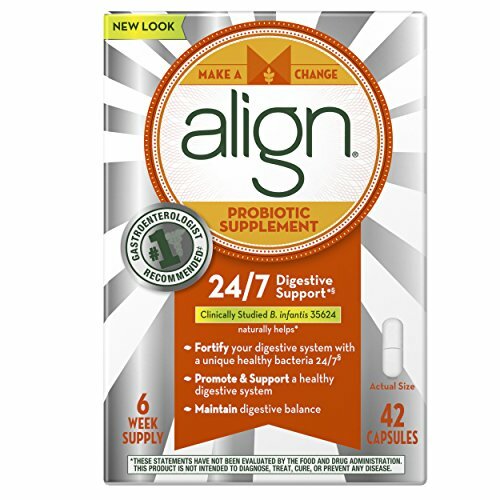 The Align probiotic supplement contains the bacterial strain Bifiobacterium infantis 35624 (also called Bifantis). This bacterial strain was isolated by the Department of Microbiology at the University College in Cork, Ireland. At the time, their work was unique in that they isolated the strain directly from surgically-removed pieces of human small intestine. Most other researchers were isolating strains only from the feces. Because it was able to survive the digestive tract of a mouse and helped improve a mouse model of inflammatory bowel disease, it was used in additional studies. After initial studies with volunteer ulcerative colitis patients showed that Bifantis could survive the stomach juices and make it to the colon, a randomized double-blind trial was performed with IBS patients in 2005. This means that the patients were randomly assigned to treatment and placebo groups, and both the patients and the experiment administrators had no idea who belonged to each group. Approximately 25 patients were in each group. They were given a malted milk drink with or without 10 billion live bacteria. Significant improvements were seen in the patients that received Bifantis during the eight-week period. Positive changes were noted for bloating, pain and bowel movement difficulty. However, these changes were erratic over the treatment period. On some days, there were no measurable effects at all. However, as there were no significant differences between groups before treatment, the Align bacteria were definitely responsible for the changes between the groups.One year later (2006), an additional study was published with even more patients. In this study, women with IBS were given either one million, 100 million or 10 billion beneficial bacteria for four weeks and their improvements were compared with a placebo group. The 100 million bacteria dose was the clear winner. At the end of the four-week period, this group had more improvements than their placebo group peers. They saw improvements in abdominal pain, bloating, gas and bowel habits. Even more importantly, the patients felt like their symptoms were improving. Sixty percent of those getting 100 million bacteria felt that they were improving during the treatment as compared to approximately 40% in the placebo group, a statistically significant difference. However, the story doesn’t end here. Interestingly, a visit to a related Align site revealed some, not so exciting, unpublished clinical trial data. In this double-blind, randomized trial, 39 IBS patients were given one billion bacteria per day while the 37 other patients got a placebo. No improvements were noted for the IBS symptoms after probiotic treatment. The unpublished observations give a surprising twist to what was a very pleasant story about Bifantis, and I applaud the manufacturers for putting this data on one of their sites. However, before we make the conclusion that the previous studies are faulty, it’s smart to look critically at the studies. It could be that the dosage was the crucial factor in the last study. In the unpublished study, they used one billion bacteria per day, which is 10 times higher than the most effective dose in the 2006 study. In the 2006 study, the high dose group (10 billion) showed no effects at all. It could very well be that this or a multitude of reasons led to the loss of a good result. Unfortunately though, this does mean that further clinical studies will be needed to make the evidence for the Align probiotic rock solid. Dunne C, Murphy L, Flynn S, O'Mahony L, O'Halloran S, Feeney M, Morrissey D, Thornton G, Fitzgerald G, Daly C, Kiely B, Quigley EM, O'Sullivan GC, Shanahan F, Collins JK. "Probiotics: from myth to reality. Demonstration of functionality in animal models of disease and in human clinical trials.." Antonie Van Leeuwenhoek. 76 (1999): 279-292. McCarthy J, O'Mahony L, O'Callaghan L, Sheil B, Vaughan EE, Fitzsimons N, Fitzgibbon J, O'Sullivan GC, Kiely B, Collins JK, Shanahan F. "Double blind, placebo controlled trial of two probiotic strains in interleukin 10 knockout mice and mechanistic link with cytokine balance.." Gut. 52 (2003): 975-980. Atte von Wrighta, , , Terttu Vilpponen-Salmelab, Marta PagÃ¨s Llopisa, Kevin Collinsc, Barry Kielyc, Fergus Shanahanc, Colum Dunnec "The survival and colonic adhesion of Bifidobacterium infantis in patients with ulcerative colitis." International Dairy Journal. 12 (2002): 197-200. O'Mahony L, McCarthy J, Kelly P, Hurley G, Luo F, Chen K, O'Sullivan GC, Kiely B, Collins JK, Shanahan F, Quigley EM. "Lactobacillus and bifidobacterium in irritable bowel syndrome: symptom responses and relationship to cytokine profiles.." Gastroenterology. 128 (2005): 541-551. Whorwell PJ, Altringer L, Morel J, Bond Y, Charbonneau D, O'Mahony L, Kiely B, Shanahan F, Quigley EM. "Efficacy of an encapsulated probiotic Bifidobacterium infantis 35624 in women with irritable bowel syndrome.." Am J Gastroenterol.. 101 (2006): 1581-1590.